Photo courtesy of Farmhouse Inn. Sonoma isn't all wine tastings and big meals. Well, actually, it is. But then you need a place to rest your head. 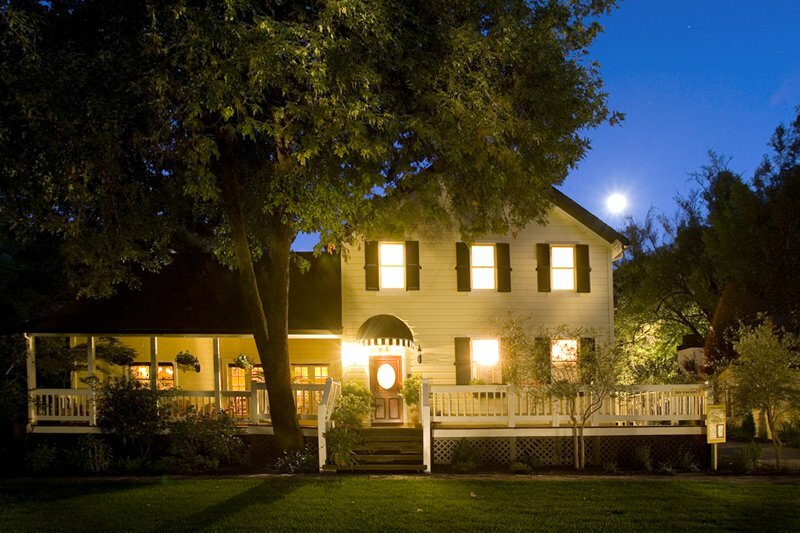 Emily Fiffer checks into one of the best, Farmhouse Inn, which made our list of the . FORESTVILLE, California — First things first: I am terrible at sitting. Vacations built for relaxation cause me great anxiety. When I'm done gazing at the ocean, what can I do? But rules did not apply and neuroses stayed at bay when I visited in Forestville, California, in the heart of the Russian River Valley. It's rare that I travel someplace where I'm looking forward to doing so much and am content doing so little. The Farmhouse Inn taught me to sit still — and not feel anxious about it. Here's how. They're for people, too. People who enjoy white wood paneling, marble bathrooms, high ceilings, indoor/outdoor fireplaces, private decks, and pretending that they're living in a photo shoot (these rooms have graced the pages of many a style magazine). Our room — replete with a sliding barn door — had me at the threshold. I am not a bath-lover. But when we checked in, I was overwhelmed by a scent emanating from jars lining the walls. When I learned that the Sonoma-made Sumbody bath products were there for the taking, I gleefully filled wax paper bags with milk baths, salts, and scrubs. If there was a place to start taking baths, this was it. Our Jacuzzi overlooked miles of dense forest. I took more baths in three days than I'd taken in 29 years. This place ain't cheap, which means "breakfast is included" translates into a seated, two-course meal where a waitress brings you newspapers and the menu changes daily based on the chef's whims. There's no better way to start the day: plump strawberries with fresh mint, lemon-specked scones, huevos rancheros, buttery waffles, and the best darn coffee ever. At night, the restaurant serves decadent California-style plates and, on Mondays, a $49 three-course prix fixe which might include big-eye tuna tataki and rabbit three ways ("Rabbit Rabbit Rabbit" on the menu). Don't skip dessert no matter how full you are. We're still talking about our pear-almond tart. Next to the tubs of bath goods were jars containing products I had no problem recognizing: squares of good dark chocolate, ragged cubes of homemade marshmallows, crispy grahams. Presenting guests with s'mores ingredients without a fire would be cruel, but the outdoor communal fire pit takes care of that. This is the best way to end the day and a fun way to get friendly with other guests. Everyone is so happy to be at the Farmhouse, and it shows. We met lots of interesting, awesome people around that pit: a women's rights activist from Mississippi, designers from Brooklyn, sommeliers from California. You might have guessed that I don't revel in sleep. But when faced with a bed that can only be described as Grandma's bosom, a couch that rivaled the bed in comfort and size, and heated bathroom floors (I tried sleeping there; I don't recommend it if vacationing with a boyfriend), I couldn't wait to lie down. Every surface beckons. Plus, it's hard to pass up a nap after a day of wine tasting. When I grow up, I want to have a fireplace in my house. I'm from Chicago; I kind of deserve it. Farmhouse set the bar sky-high. I'd never seen an indoor/outdoor fireplace before. Now that I have, I'm planning on striking big at the lotto so I can afford one. Learning to be still has never been so easy. Fly to San Francisco (SFO) or Oakland (OAK) airports. The drive is about 90 minutes from either. Car service is available through the hotel, but with so much to see in the area, you'll want a rental car. Sonoma County Airport (STS) is has direct flights from Seattle, Portland, Los Angeles, and Las Vegas on Horizon, a division of , and is only ten minutes away. Bonus: Horizon lets you check a case of wine for free on your flight out of STS.